The sweet pastry for this festive tart is made with ground almonds and spiced with cinnamon. 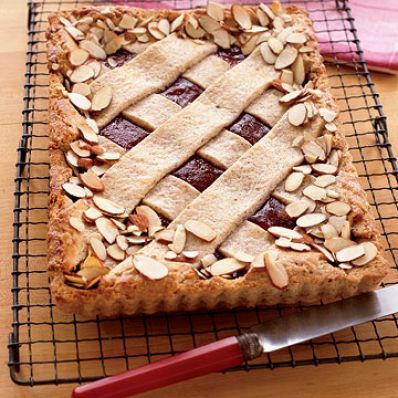 The lattice topping shows off the cherry filling, tempting guests to cut the first piece. 1 of 7 Heat oven to 400 degrees F. Coat a 10 x 6-inch tart pan with removable bottom with nonstick cooking spray. 2 of 7 In a large bowl, whisk flour, cinnamon and salt. Cut in butter with a pastry blender until mixture resembles coarse crumbs. Stir in sugar, ground almonds, then eggs. Work into a ball. Knead a few times in the bowl if necessary to bring dough together. Divide in half. 3 of 7 Press half of the dough into the bottom and up the sides of prepared pan. Bake at 400 degrees F for 10 minutes. 4 of 7 Roll remaining dough between parchment or waxed paper to 1/4-inch thickness. 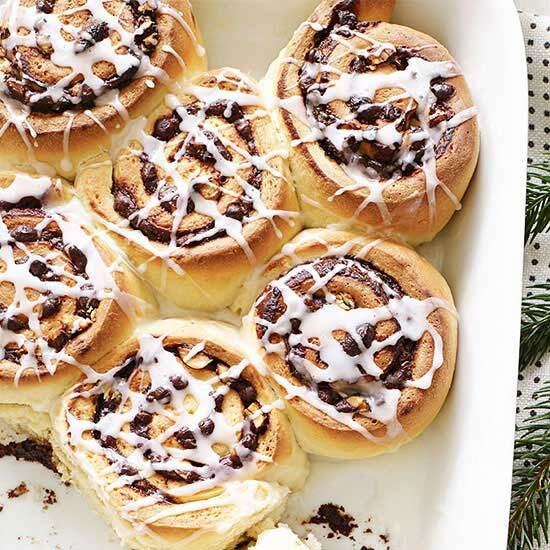 Put on baking sheet; freeze 10 minutes. 5 of 7 Puree preserves in food processor, spread over bottom of tart. Remove top sheet of paper from chilled dough. Using a pastry wheel or pizza cutter, slice dough into 3/4- to 1-inch diagonal strips. Arrange on top of preserves in a lattice fashion. 6 of 7 Beat yolk with 1 teaspoon water; brush lightly on lattice. Place in oven and reduce temperature to 350 degrees F. Bake for 15 minutes. Remove from oven; brush edges with egg wash. Sprinkle almonds around edge. Bake for 15 more minutes. 7 of 7 Cool for 15 minutes on wire rack. Gently remove sides and cool completely. Per Serving: 42 g carb., 7 g pro., 21 g Fat, total, 133 mg sodium, 2 g fiber, 378 kcal cal., 7 g sat. fat, 67 mg chol.